Many breeders dream about breeding a once-in-a-lifetime horse who competes in prestigious arenas like Aachen. Others dream about breeding an approved stallion. We interviewed a breeder who has realized both. In Aachen 2018, there were two jumpers bred by Perry De Winter, who has produced a string of outstanding horses performing at the highest international level, including Gancia de Muze, J’Adore van het Schaeck, Cacacha van het Schaeck, Like A Diamond van het Schaeck, and Caipiranja. During a recent visit to his studfarm, I saw a great number of promising youngsters, so in the future we will be seeing more ‘van het Schaeck’ showjumpers collecting victories and honourable placings worldwide. 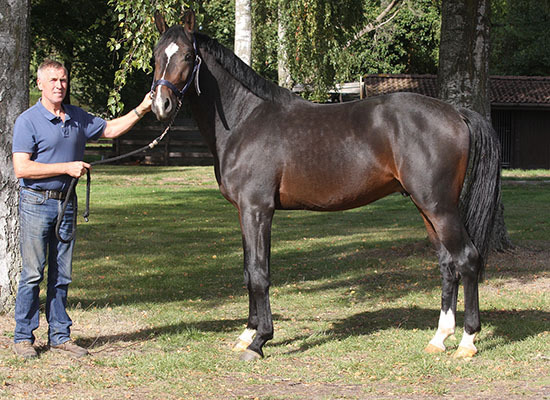 The breeder behind this famous studfarm is Perry De Winter. Born in 1959, De Winter is married to Tanja T’joens and is the father of Geoffrey and Bo. Early on in his breeding programme he produced 10 foals, then and now using famous stallions such as For Pleasure, Darco, Diamant de Semilly, Plot Blue, Untouchable and Comme Il Faut. “I am very happy that I still own two daughters of Darco. I will never sell them,” De Winter said. Valentijn De Bock, Tim van den Broeck, Katrijn Van Hoecke, Klaas Koentges, and Stephanie De Vriendt are all riding some of his horses, and each year the latter also rides two of De Winter’s own-bred five-year-olds. Q Why did you buy Walloon and Walnut? Next articleYear-end rankings 2017-18: Who came out on top?